Oh, and those two shots. “It’s definitely been a great few weeks,” Notre Dame guard Arike Ogunbowale said in a phone interview with The Associated Press. 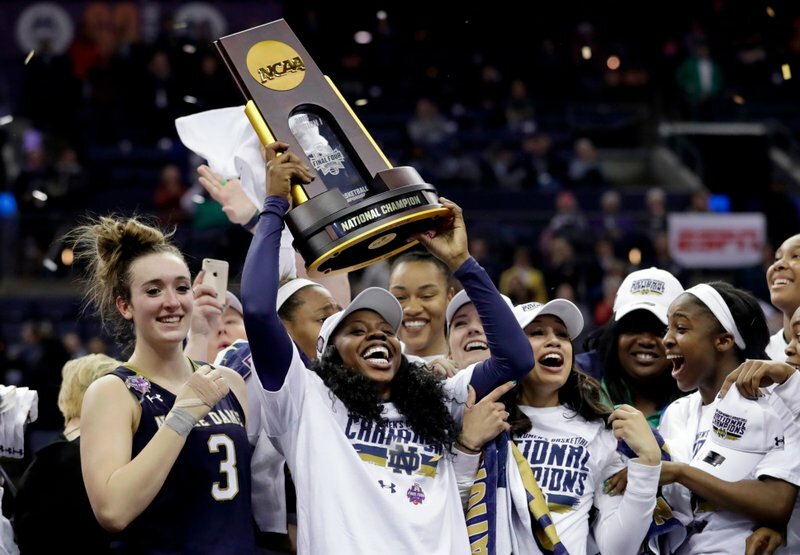 Fresh off leading the Irish to the school’s first women’s basketball national championship in 17 years with two incredible buzzer beaters , Ogunbowale is still on a roll. She’ll appear on Dancing With the Stars on Monday night on the all-athlete edition. She needed a waiver from the NCAA to appear on the show and accept any of the benefits, including prize money, that comes with her participation. “At first the NCAA wasn’t going to approve it, but they changed their mind,” Ogunbowale said. Her dance partner, Gleb Savchenko, has relocated to South Bend, Indiana, for rehearsals. The pair will fly to Los Angeles each week to perform. “He’s been at school with me, and it’s probably harder on him going from Los Angeles to South Bend,” she said. If Ogunbowale makes it through the first week of the show, she’ll have exams at Notre Dame to juggle as well. The NCAA did put restrictions on Ogunbowale. She can’t promote her appearance on the show on social media or anywhere else. Neither can any Notre Dame officials, like coach Muffet McGraw. That won’t stop her Irish teammates from trying to drum up votes for her. She wasn’t with the rest of the cast, which includes Kareem Abdul-Jabbar, Adam Rippon, Jennie Finch and Johnny Damon, when they were announced on Good Morning America a few weeks ago. Ogunbowale is looking forward to meeting Abdul-Jabbar, a basketball legend she admires. One person who will be cheering on Ogunbowale is former Secretary of State Condoleezza Rice, who chaired a commission on college basketball that announced its recommendations last week. Ogunbowale will have other stars cheering her on, too. She’s become Twitter friends with Kobe Bryant, who presented her with an autographed jersey on the Ellen DeGeneres Show. They were joined by Ice Cube for a brief 2-on-2 contest . The junior guard has shown her cool on the basketball court. She’ll need to rely on it on the dance floor. Her good friend Kristine Anigwe, who plays basketball at Cal, plans to make the trip to Los Angeles to see the show live. The pair was just in Colorado Springs, Colorado, to play in a USA Basketball 3-on-3 tournament.